January can not only bring a lot of beautiful snow, but also slippery ice and freezing temperatures. Whether you live up north where it easily drops below zero, or down south where it can cool down into the 30’s and 40’s, you’ll want to take extra steps to ensure your loved one stays happy and healthy this winter. Here are 5 tips to be fully prepared for the winter months. Many people will spend a majority of their time indoors during the season, going days without stepping outside. This is why it’s very important to have the home prepared for this amount of quality time at home. It’s easy for your loved one to become ill if the home is not kept warm enough. If using a fireplace or gas heater to warm up the house, make sure to have new batteries in both your carbon monoxide and smoke detectors. A regular tune-up on the home’s furnace should be done routinely. In case the power in your loved ones home goes out during a storm, have the readily home stocked with non-perishable food, flashlights, battery-powered radios, and blankets. As the temperature of the home drops, have the appropriate garments ready to wear, i.e. several layers of warm clothes, hats, gloves, and scarves. To prepare for emergencies, a landline phone is useful in case cellular service is disrupted. If you venture out with your loved one, take both coats and boots off when entering the home to prevent water from collecting, causing the floors to become slippery and increasing the possibility of a fall. Staying inside can make it very easy to snack on the wrong foods and forget about regular meals. Keep up with a healthy diet and consume foods that are high in vitamin D. Generally we get vitamin D from the sun, so supplementing diets with vitamin D-rich food, such as seafood (tuna and salmon), grains, and milk, can help make up for what we aren’t getting in the winter. Trips to the doctor’s office or the grocery store can be a worrisome task in the winter months, especially when the walk to the car itself can be dangerous. 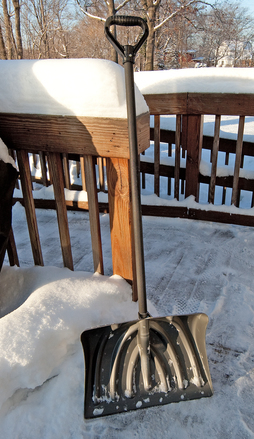 Shovel and salt the sidewalks and driveway to help prevent any slipping or falls. If the need to go out isn’t urgent, stay home as much as possible, especially during winter storms that cover the streets and public sidewalks in a blanket of snow. The winter months make it very easy for anyone, especially our older family members, to get sick. The most common illness among older individuals in the winter is hypothermia, pneumonia and bronchitis. Wear the right garments when venturing outside. To prevent the core body temperature from dropping, bundle up in warm socks, thick pants tucked into snow boots, a heavy winter coat with a hood, a thick hat and gloves, as well as a scarf that will not only keep the neck warm, but cover and protect the face from harsh winds. It is also easy to become sick indoors when not wearing the proper clothing. When indoors, wear socks and/or slippers to keep the feet warm, as well as long pants with a long sleeve shirt or sweater. Driving in sleet and snow is dangerous for all drivers, even more so for our older loved ones whose reaction times might not be as quick as they used to be. Schedule a service appointment to prepare the car for winter. Also, stock the car with supplies to prepare for possible situations. This may include a spare tire, extra oil, windshield washer fluid, extra windshield wipers, an ice scraper, blankets, granola bars, flashlight, salt, a shovel, and some water. In case of icy conditions, keep a bag of kitty litter handy. Sprinkling it over the snow or ice in front of your tires creates the necessary traction to get moving, and it is lighter than salt making it easier to carry for older adults.